Biennial plants require two years to complete its life cycle, they are usually sown in one season (e.g: summer) to flower in the next season (e.g: spring and summer). It is taken from the Latin biennis which means ‘two years’. 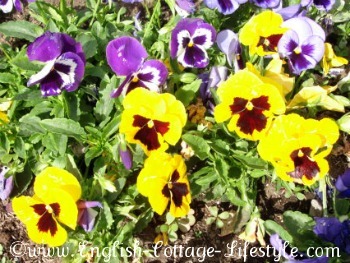 English Cottage Garden Biennial Plants. Biennials are not that popular as they take more than one season to flower. That being said when they do go into flower they can be spectacular so do not write them off just yet. They are traditional to the English cottage garden and can be hardy and self sowing like the Foxglove. When you are choosing biennial for your cottage garden you may need to seek advice at your local garden centre as the winter hardiness of biennials will depend on your district, plants such as Primula may not winter well. Biennials are normally planted out in the late summer or autumn to bloom the following summer, if your biennials are hardy enough to winter well. Canterbury bells and Sweet Williams, for example, planted out in autumn will flower well the next summer, plant them out in spring and you will have to wait till next spring for flowers. Biennials are usually sown outside or in a cold frame or greenhouse then transplanted as seedlings to where you want them to grow in autumn. Forget-me-nots need to be planted in autumn as they flower early in the season. When you sow biennial seeds you will first have leaves and then the following year you will have flowers. They are well worth the wait especially if they self sow and no cottage garden would be complete without Foxgloves. If you are in a hurry your local garden centre may have year old biennial plants ready to plant in the garden then your plants should flower that year. Some biennial plants such as Wallflower and Sweet William are almost perennials, especially in the south. After they flower they look messy or not as good next year and get dug up and removed. In each plant portrait and growing guide I will mention if they cross over into Biennial, Annual or Perennial. These are plants that are sown the year before they are expected to flower. For best results they should be planted out in autumn. Its best to plant out early in the season as waiting till it gets colder could produce smaller flowering plants. Here is a list of favourite cottage garden hardy biennials. (You will soon be able to) click on the plant name to get the growing guide and portrait for each plant.